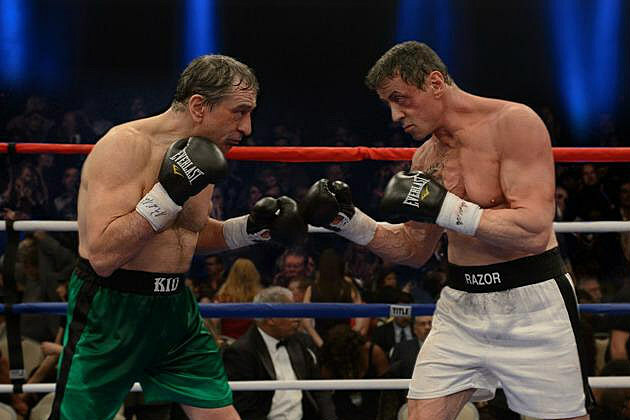 Two actors who should know better (Robert De Niro and Sylvester Stallone) play two boxers who should know better as they step into the ring to settle a long standing score. This film has rather flatteringly been termed “Rocky v Raging Bull“, a crossover between its stars greatest films, when in actual fact it’s closer in quality to Meet the Fockers v Stop! Or My Mom Will Shoot. The real life rivalry between the two goes back to the Academy Awards of 1976, when Rocky won big, sending Taxi Driver home empty handed. At least they’re on even ground knowing Grudge Match won’t be winning any Oscars. The film opens with a TV news report explaining the long-term rivalry between Razor Sharp (Stallone) and The Kid (De Niro), with their past fights ingeniously assembled from CGI and archive footage. The snippets of fights in the film’s opening are more exciting than anything that happens in the rest of the film, as it actually looks like Rocky Balboa and Jake LaMotta are fighting each other. It just goes to show that if this film had to be made, it should have been thirty years ago. It’s a film that suffers from having no inspiration beyond its overriding concept, which is a problem, because when the grudge match finally happens it’s certainly not like watching cinema’s greatest boxers go head-to-head. Most of the stuff before the fight is just padding to get to the inevitable confrontation. There’s no triumphant Rocky-style training montage or Raging Bull-style angst and drama, just some stuff about their friends and family, and a constant lamentation of the past. This seeps through into the fibre of the film, leaving us wishing we were watching these men at their best. It’s not an over the top farce comedy like it could have been, which is, I suppose, a good thing, but the drama of these two characters never rises above their repeatedly getting on each other’s nerves. Thankfully Alan Arkin is there to provide at least a little of the promised comedy as Razor’s ageing trainer, but the laughs are not as frequent as they need to be. And then it comes to the fight. When this film was announced, my co-goblin Dan tweeted that De Niro had better start working out, or it would just be Sylvester Stallone beating up an old man. This isn’t far from the truth. The problem is that De Niro, once renowned for his commitment to his performances, is now an incredibly lazy actor, choosing to churn out rubbish rather than invest in quality. This is a problem when you’re in a boxing movie. I don’t doubt he hit the gym before this: he certainly seems to do a couple of real pull ups at one point. But he can’t seem to shake the moobs. Well, he can. That’s the problem. When he removes his gown in the ring, his pot belly balanced on the spindly legs completely typical of a man of 70 is just embarrassing. His wrinkly torso jiggles around like a turtle out of its shell. 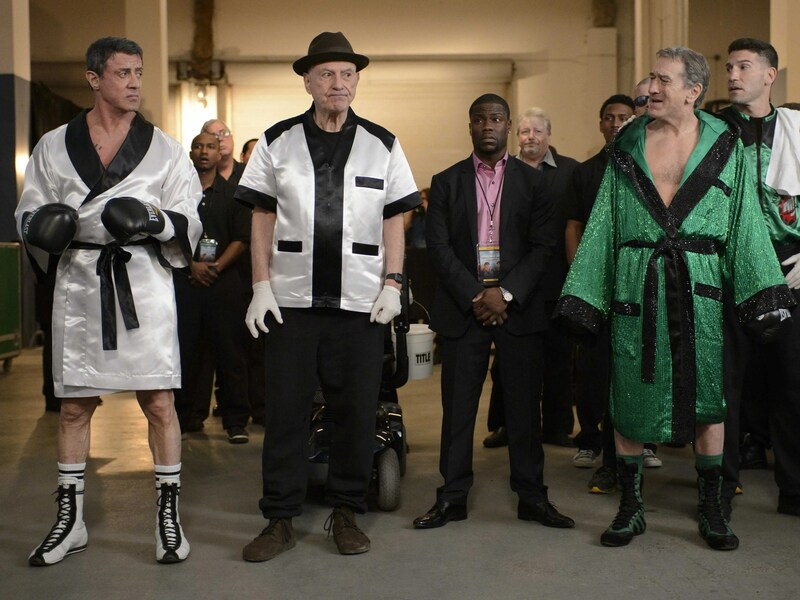 Stallone looks old, too, but also like he could rip a phone book in half and throw a decent punch. The only thing De Niro is going to use a phone book for is ordering pizza. The screen writers try and compensate for this difference. Stallone’s character is made to be blind in one eye, and the commentators helpfully inform us that The Kid is “stronger than he looks”, but in truth it’s a pretty cringe-inducing display. The final fight is actually hard to watch, not because of the violence, but because it’s wrong. Wrong wrong wrong. In a post Rocky Balboa interview, Stallone was asked if there would be another Rocky film. “Who would I fight? Arthritis?” he amusingly quipped. Fighting a flabby De Niro is far worse to watch. Rocky inspired a lot of people to take up boxing. The only thing Grudge Match will inspire people to do is book a place at Dignitas. Ha! Hilarious review! My boyfriend wants to see this but luckily for me he doesn’t like going to the cinema, so I’m safe until the DVD release. Lucky you. This one’s definitely better to avoid. Wouldn’t even consider this, two big actors kind of ruining and shaming their careers! Trailer probably ruins the funny moments, sorry you had to view this but nice review! Yeah half the funny bits were ruined in the trailer. It’s often the way with comedies.